Spiceologist, a local spice packaging and retailing company, is moving into 8,000 square feet in a building at 125 S. Cowley, in the University District. Spiceologist was co-founded by Pete Taylor, an executive chef and Heather Scholten, a food blogger, in May 2013. The two foodies have built the brand into a nationally recognized rub and spice company. Pete & Heather created the award winning Spiceologist Block and funded the production with a successful Kickstarter campaign. The Spiceologist Block holds up to 44 gourmet spices on your kitchen countertop stylishly. Pete & Heather are passionate about food and flavor, and when you try their spices you'll understand why. Follow them on Twitter at @spiceologist and @farmgirlgourmet. You can learn more about Spiceologist and find their other retail locations at their website spiceologist.com. Benniditos, which has been serving pizzas and more at 1426 S. Lincoln since the mid 90's, has opened a new brew pub in the University District at 1909 E. Sprague. The full brewpub has on on-site brewery, making their own beers. In addition to Bennedito's famous pizza, they also serve salads, soups, sandwiches and more. The 14th and Lincoln location remains open. Barrister Winery is opening a downtown tasting room across from the new Davenport Grand Hotel, designed for visitors to Spokane, especially those attending conventions. It's in the Liberty Building (where Auntie's Bookstore is located), 203 N. Washington, and Auntie's unused east entrance is being re-opened for the tasting room. Barrister's winery and tasting room at 1213 W. Railroad Ave. will remain open. The new downtown location should be completed by October. 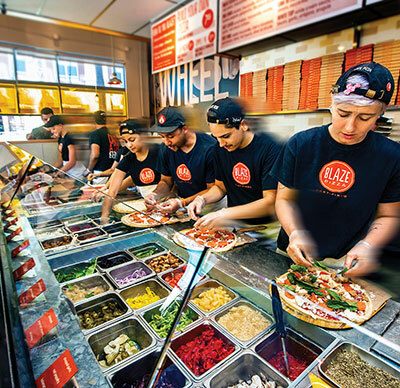 Blaze Fast-Fire'd Pizza, the fast-casual concept known for its chef-riven menu and casually hip restaurants, will soon open its first Washington state location in Spokane at 926 N Division, near Gonzaga University. The restaurant, which will feature a 2,600 square foot interior with seating for 52 inside and an outdoor patio, will open this September. Pizza is a modern day 'pizza joint' that has been inspiring excitement and cultivating fanatics for its custom-built artisanal pizzas, freshly made salads, blood orange lemonade and s'more pies since it opened its first location in 2012. The restaurants features an interactive open-kitchen format that allows guests to customize one of the menu's signature pizzas or create their own, choosing from a wide selection of carefully sourced, high-quality ingredients, all for under $8. The generously sized personal pizzas are then sent to a blazing hot open-flame oven, the centerpiece of the restaurant, where the thin crust pies are fast-fire'd and ready to eat in just 180 seconds. Blaze Pizza will also offer gluten-free dough and vegan cheese, and will feature a selection of wine and craft beer. The Spokane restaurant will use both recycled and sustainable materials and energy-efficient LED lighting, and will feature eco-friendly, compostable packaging. For more information, visit blazepizza.com and find them on Facebook. This year's Night Under the Stars, will be this Thursday, August 13. The event will benefit the Inland Northwest SIDS Foundation, and runs from 5-8pm at the Elk Point Estates. Featured artists will be Ron Greene and Big Honey. Drinks and appetizers are available throughout the evening. Tickets are $25 and are available by calling 208-557-4371, or email at info@inwsids.org. The second annual Tree School, an educational conference that provides professionals and backyard gardeners with everything they need to make their landscape healthy and productive, will have a seminar scheduled for this Saturday, August 15 from 8am-5pm at the WSU Spokane Phase 1 building. This year's theme is, 'Wildfire: Yesterday and Today' with keynote presentations by well known naturalist and author, Jack Nisbet and former Spokane mayor, Mary Verner. According to Erica Johnson of The Spokane Conservation District, "We anticipate almost two hundred participants will be attending to learn how to make their landscapes healthy and productive. Whether they are attending in a professional capacity as arborist or forester, forest landowner or backyard gardener, everyone will find information relevant to their needs through the twenty different concurrent seminars in which they can participate." New this year at Tree School will be a vendor fair to increase networking and learning opportunities. Vendor tables are still available and can be reserved by contacting The Spokane Conservation District. The cost to register for Tree School is $50 per person and includes continental breakfast and lunch. For more information, and to register, visit sccd.org/forestry.html. Tree School is organized by the Spokane Conservation District, Washington State University Spokane County Extension and Washington Department of Natural Resources. Lamination Technology Industries, Inc. has leased approximately 40,000 square feet of space in Building 29 in the Spokane Business & Industrial Park at 3808 N. Sullivan Road, in Spokane Valley. Their primary business is lamination of decorative overlaid panels and components. Chef Katie Freeman has released a new lunch and dinner menu at Remington's Restaurant located in the Spokane Airport Ramada, 8909 Airport Drive. The new menus showcases fresh, local fare. The lunch menu includes sandwiches, soups, salads and pizza and the dinner menu offers an extensive variety of seafood, fish, fowl and beef. A large variety of local beer and wine is offered in Remington's lounge and can be paired with menu selections. For more information, call 509-838-5211. The Inland Northwest Community Foundation's Annual Reception, celebrating 41 years of connecting people who care with causes that matter will be held on Monday, September 21, from 5-7pm at The Davenport Hotel. Thomas Hammer Coffee will be opening a new location in mid-September in a former Rocket Bakery location, in Fairwood Shopping Center at 319 West Hastings Rd. You can learn more about this successful local coffee company at their website hammercoffee.com. Fairwood Farmer's Market, North Spokane's newest, started late last fall in the Fairwood Shopping Center at 319 West Hastings Rd. It is now open every Tuesday through October 6. They feature farm fresh produce, freshly baked breads and cakes, small batch specialty foods, and crafts from local artisans. The market has received their beer and wine sampling license, and have 3 samplers booked through the summer showcasing and selling their luscious wines, meads, and beers. The market runs afternoons from 3-7pm. Every event hosts live music, and includes food trucks, plus a sitting area where customers can enjoy the entertainment and savor their goodies. Several neighborhoods are within walking distance, and there is also plenty of on-site parking available. Find them on Facebook.